Rogers Wireless comes out dead last in JD Powers most recent customer survey. Responsibility lands squarely on the extremely poor management at Roger’s and its third party contractor, Sykes. Many observers and former employees say it is run like an offshore sweatshop, complete with stressful bullying No quality customer service can come from such a dysfunctional work environment. The gig economy philosophy is apparent with employee’s reduced to total submission to draconian work rules, total surveillance of all voice and written communication, and apparent high turnover. Burnout is common. Three years ago, there was something of a Sykes employee revolt, when a number of supervisory employees were fired, and an anonymous broadcast email was posted describing the poor management practices. Outsourcing like this has been a common means to cut costs in the wireless industry. Rogers management seems to take an arm’s length approach, with Sykes repeatedly referencing its need to meet “the client’s (Rogers) demands,” while applying highly stressful management practices on employees. Rogers new CEO, Joe Natale claimed customer service would be his top priority. I first recommend fixing the deplorable working conditions at Sykes. As wireless carriers compete for contracts across Canada, those which go the extra mile for their customers are coming out on top, according to a survey from J.D. Power. Overall, wireless customer care satisfaction across Canada has risen to 746, up from 738 in 2016, on a 1,000-point scale, according to the 2017 Canadian Wireless Customer Care Study. 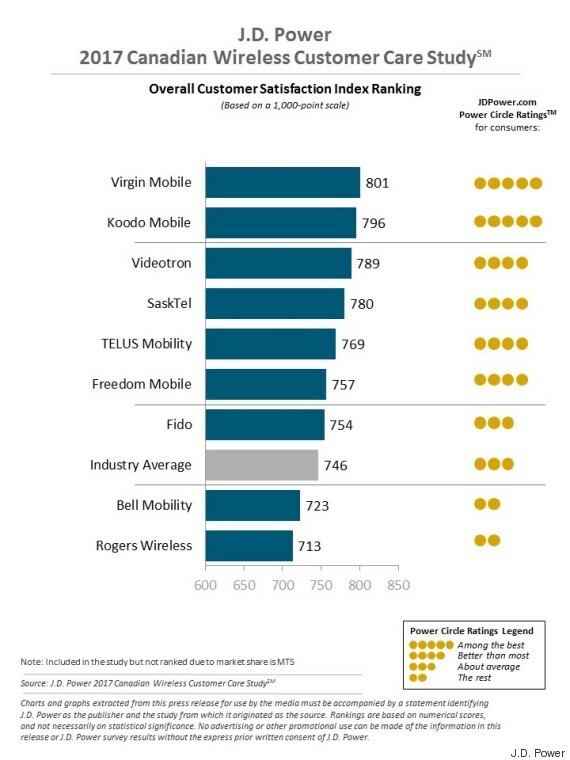 Canadians ranked Virgin Mobile, whose customer satisfaction index is 801 points, as the best in customer care, while Koodo Mobile came in a close second, with 796 points. The survey, which polled more than 5,500 wireless customers across the country, looked at four factors of customer care: phone customer service representatives (CSR); in-store service; online service; and phone automated response systems (ARS). The study found that customers rank courtesy, concern and knowledge as some of the most important factors in customer care, but also found that customers like to be greeted when entering a wireless company’s store, and enjoy being thanked during online service chats. Overall satisfaction was high when it took less than five minutes to resolve a problem online (837 points), compared with a score of 693 when it took 10 minutes or more to reach a resolution. Satisfaction is also higher at 765 when people need to navigate three web pages or less as opposed to 676 for four or more pages. As well, 40 per cent of customers cited “good customer service” as one of the reasons they selected their carrier.